I thought today’s Facebook posting (see right) was the perfect opportunity to show you some of my latest finds for my upcoming beach vacation at the end of July. 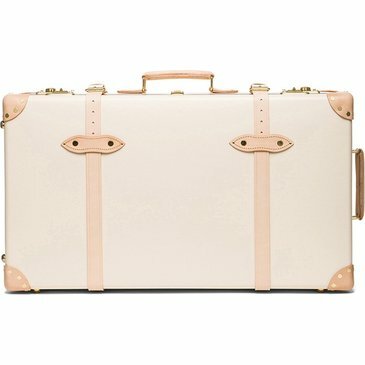 But tell me, how freaking amazing is this safari Globe-Trotter suitcase? Unfortunately I would need a couple of years to save up the money as the price is far from being affordable. However, I’m still a big fan of suitcases in 20s style. Too bad I still haven’t found any affordable model with a trolley function. Safari Reisetrolly inspired by suitcases from the 20s. Blue and white is by far my favorite color combination, that’s I went for these beautiful ANAKI espadrilles too. Perfectly matching my white jumpsuit. So much love for these HAMAMMAS beach towels. Can’t wait for the moment where I’ll be sunbathing on them and just relax. It was definitely love at first sight. – Nothing more to add! I have to say that I’m super picky when it comes to my bikini top as I can’t stand it if they don’t fit perfectly. This maxi dress went into my shopping bag too as it perfectly suits to those TIBI heels just like those ANAKI espadrilles. Loved how both combinations make the dress look completely different in style.